Application: for requiring high standard hygiene. Sole washer, cleaning the shoe sole by rolled brush with water automatically by photoelectric sensor. Material: SS304 for main body, which is prevent from rust. Working life: 6-7 years at least. 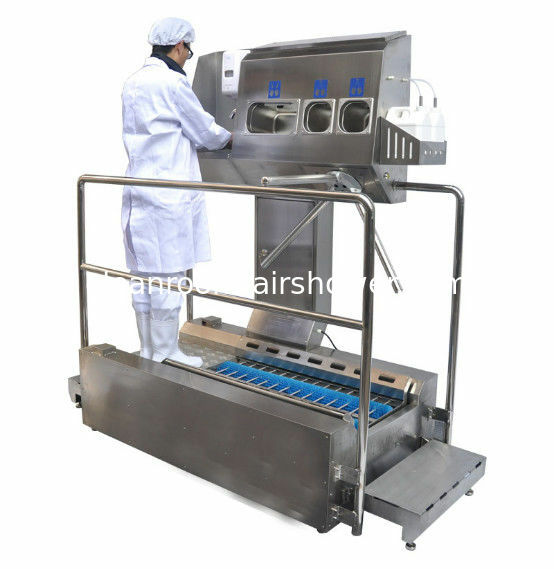 This machine for purpose of food, electronic, pharmacy, chemical industry etc. coerced into cleaning and disinfecting hand before entrance,one-stop solution to clean and disinfect hand and sole. One-stop solution to clean and disinfect hand and sole. Through start upon sensor induction avoid cross contamination. Hand cleaning function: Inductive soap liquid dispenser,inductive washing hand,inductive drying hand,inductive disinfection. Motor drive the 2 brushes on the clean stage to clean sole. User stand on the clean stage, the brushes rotate to clean the shoe soles. Need a flat and smooth floor indoor, to put the machine. Need water supply and drainage pipe or hose to connect.